There’s been much questioning in the medical library community about the nature of PubMed Health (PMH), the new source from the National Library of Medicine. When it first came out, in early 2011, it seemed to be pretty much a copy of the ADAM Health Encyclopedia that’s part of Medline Plus. Before the Medical Library Association annual meeting in May, NLM staff had said little to clarify how PMH would be different. At the MLA meeting, NLM staff said that the unique feature of PMH would be the addition of Comparative Effectiveness Research (CER) information to help consumers make health decisions. They didn’t say that adding CER information has already started, and it was only after I got back from MLA that I saw that indeed it has. I tweeted to see if anyone else had noticed this, and got only one response — PMH watcher Alisha Miles replied, saying that “limited articles” in PMH have had CER links since it launched, and that NLM is now adding more (Thx, Alisha!). I did a small random sample of 26 PMH pages and found that 6 (23%) of them have CER links. In this article, I’m providing screenshots of PMH pages that have CER data and that don’t. Below the screenshots, I have a few comments and data on the random sampling that I did. For comparison, a screenshot the Asthma page when PMH first launched in Feb, that doesn’t have CER info, is in this article. This indicates that the CER links are obtained by AND’ing together the subject (Asthma) and the CER subset. Searching the CER subset by itself <subject_comparative_effectiveness[sb]> gets 252 links. This seems like a fairly small number in comparison to the total number of subjects in PMH, so I suspect that there will be considerably more CER data added. In some cases, the indexing for CER sources may be questionable — For example: The PMH page for Brain Surgery, under Evaluating your options, has 4 links. Two of them seem doubtfully relevant – Fact sheet: Period pains and Low back pain: Can massage help? I did the random sample by looking at the first stand-alone link (not a cross reference) in the middle column for each letter of the alphabet of the PMH alpha index. It’s encouraging to see that NLM is beginning to give PMH an identity separate from Medline Plus. As discussed in another article, however, I hope NLM will do more to communicate the timetable of this process, and other CER features that they plan to add to PMH. Posted in NLM, PicsYes, Uncategorized. 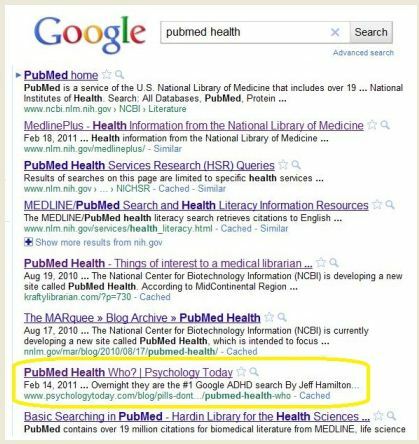 In February, Google began giving prominent placement to articles in NLM’s PubMed Health. As I discussed in a previous article, NLM and Google have been strangely silent about announcing this new feature, with no discussion of it anywhere that I can find. It’s especially surprising that Google hasn’t said anything about this because — coincidentally with the NLM boost — Google’s ranking system has been under attack recently, with charges that doctom sites (most notably JC Penney) have used Search Engine Optimization (SEO) tricks that cause Google to give high rankings to their product pages. As a member of the medical library community, it seems laughable that anyone would suggest underhanded dealings between NLM and Google, and in my previous article I described Hamilton’s idea as “hare-brained.” But thinking it over I realize that to a non-librarian who’s been reading about the recent Google-SEO controversy, Hamilton’s speculations seem more reasonable. As he says, it does indeed seem surprising that PubMed Health pages suddenly began appearing at the top of Google’s rankings, with no explanation from Google or NLM about why this is happening. The story gets more meta-interesting because Google’s ranking of Hamilton’s SEO story itself becomes part of the story — If the article had stayed on his blog, it probably wouldn’t have gotten much attention from Google and hence the eyeballs of the world. 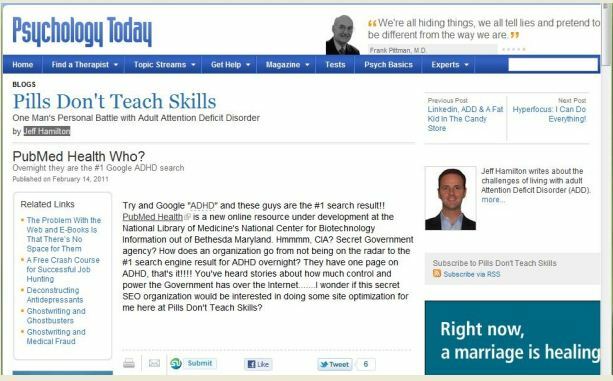 But instead it got copied on the Psychology Today blog, and that brought it a high ranking (generally between #1 and #6 in the last two weeks) in a Google search for PubMed Health — So, let’s say you’re a health-information-seeking consumer who comes across a PubMed Health page in a Google search — You like the page, so you do some googling to find out more about PubMed Health — And what do you find? Hamilton’s NLM-CIA conspiracy article. So what’s wrong here? Why is a standard resource by large government site like NLM not able to outrank a blogger’s speculations about its validity in a Google search? Normally, Google does a good job finding “the real thing,” the site itself. The problem, I think, is that there has been nothing for Google to link to for “PubMed Health” — It didn’t even have a home page until last week, when it was announced by NLM/NCBI in Twitter. And there still hasn’t been a press release or longer announcement by NLM or Google. If these sources existed, they and medical library bloggers discussions of them would soon dominate Google’s top ten, and leave wild NLM-CIA conspiracy speculations in the dust. I’d guess that sooner or later, NLM and/or Google will make some sort of announcement. But I’d predict that the longer they wait, the harder it will be to displace Hamilton’s article from its high ranking — In my experience, Google has a persistent memory, and it often holds on to links after they have been obsolesced by events. I think this is an excellent example of why librarians should learn more about SEO — If people at NLM and in the wider medical library community were paying more attention to SEO, it would have been clear that the sudden appearance of a new resource from NLM at the top of Google searches needs to be explained. Learning more about SEO — If you google for SEO be ready for a fire-hose of sites offering to help you get a Google ranking. You might want to start out with Wikipedia’s lengthy SEO article or a book on SEO in the Dummies guide series. Posted in Libraries, NLM, PicsNo, SEO, Uncategorized. 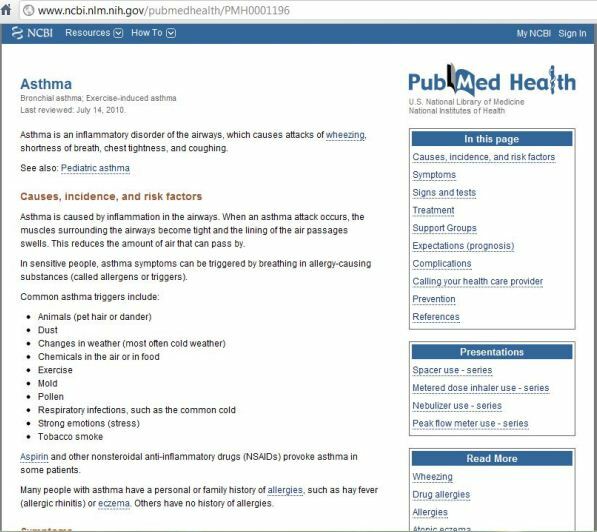 I just noticed last week that Google is now ranking pages from the National Library of Medicine’s PubMed Health encyclopedia at the top of search results for disease words (accompanied by an attention-getting red icon) as shown at left for asthma. 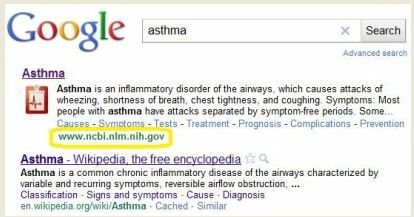 Other disease examples putting NLM at the top of search results are diabetes, migraine, lupus, and chickenpox. So, Congratulations, NLM! — A great new opportunity to lead people to the wealth of information at your site! There are questions though — I was surprised to find this prominent placement for NLM (which replaces less prominent placement in the Health OneBox group of links at the top of Google searches that I wrote about in 2009). There apparently has been no announcement of the change, either from NLM or from Google, as far as I can find in searching. Beyond that, I also can’t find that NLM has announced the launching of the PubMed Health (PMH) encyclopedia that’s linked from Google. It was mentioned as being in development in summer, 2010, but there’s been nothing since saying that it was completed and ready to use. 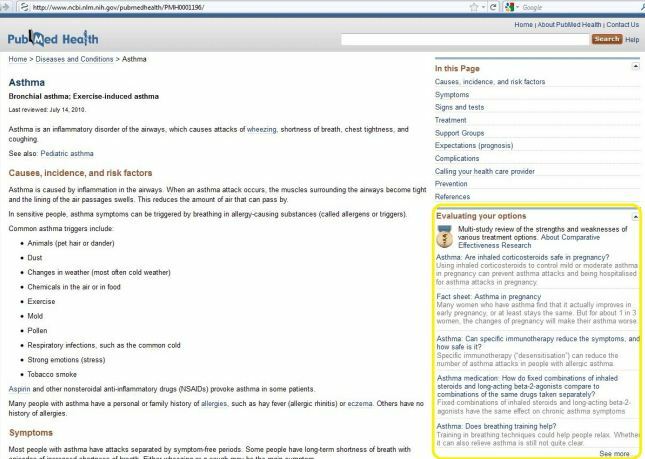 There are also questions about the PubMed Health pages that are linked from Google (first screenshot below). 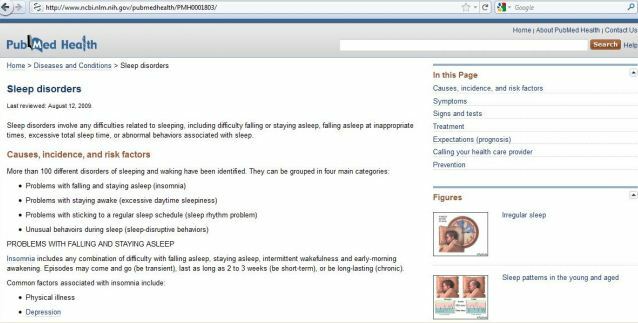 These are from the ADAM Health Encyclopedia, and the same content is also part of NLM’s MedlinePlus (second screenshot below) — Why is NLM maintaining two different versions of the same content? Also, the PMH page that’s linked from Google (in the first screenshot below) has no link to MedlinePlus (MLP). The MLP version of the ADAM content, on the other hand (in the second screenshot below), is tightly integrated into the wealth of other information in NLM’s flagship MLP resource. 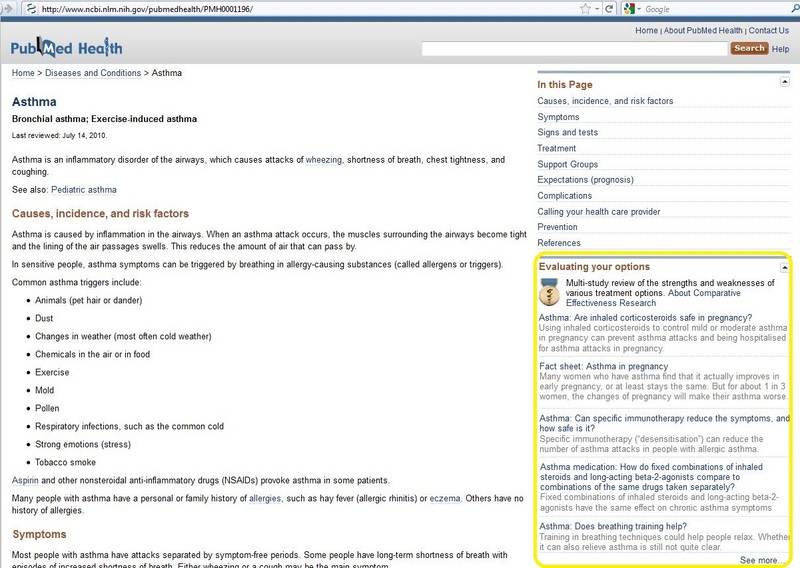 Below is the PubMed Health page that’s linked at the top of the Google search for asthma. 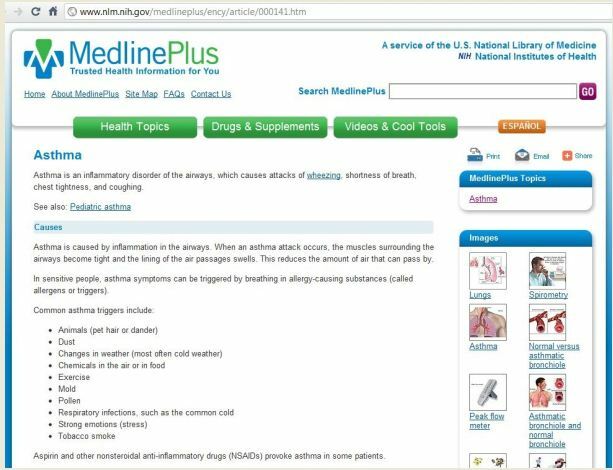 This page has no link to MedlinePlus, in contrast to the MLP version of ADAM content, in the second screenshot below. Here’s the MLP page for asthma, that’s well-integrated into other resources in MLP. So, NLM, how about asking Google to link to MLP instead of PMH? Otherwise, if the Google link continues to go to PMH pages, make a link from those to MLP! Posted in Google, NLM, PicsYes, Uncategorized.